If you're stumped about what to give for Christmas, or what to put on your own wish list, I have an idea for you: a quality chef's knife. I got one for my birthday last year, and it really changed the way I approached cooking. Suddenly chopping vegetables was fun instead of tedious. Gone were the days of sawing and hacking my way through meal preparations; now my knife was gliding through onions, peppers, and potatoes with a satisfying whoosh and a crunch. I still could use some help with my technique (and I hear there are great classes available to help with that), but I'm no longer shying away from recipes that require a lot of chopping. One of the reasons it took me so long to get a great knife was that I felt I would need to invest in a whole chopping block of cutlery. But most great cooks and chefs will tell you that you don't need a whole arsenal of knives - only one great chef's knife, and perhaps a few specialty knives such as a paring knife or serrated bread knife. 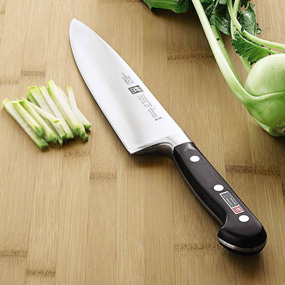 A great chef's knife will cost around $100, maybe a little less or a little more. The one I have is a Global 8" chef's knife, and I love it. Any food store like Williams-Sonoma or Sur la Table will have a good selection. It makes a great gift because it's something anyone who likes to cook will appreciate, but most will hesitate to spend money on it for themselves. And it's a worthwhile investment because it should last forever if properly cared for. I do want to learn how to chop as I find is so fascinating when watching the chefs and their chopping techniques. I would love a great knife. And you're right, we don't need a whole array of knives. Except for the odd tasks that do require specific blades, the other 95% of the time I find myself reaching for same knife over and over again. I think I'd be a danger to myself with a good knife.